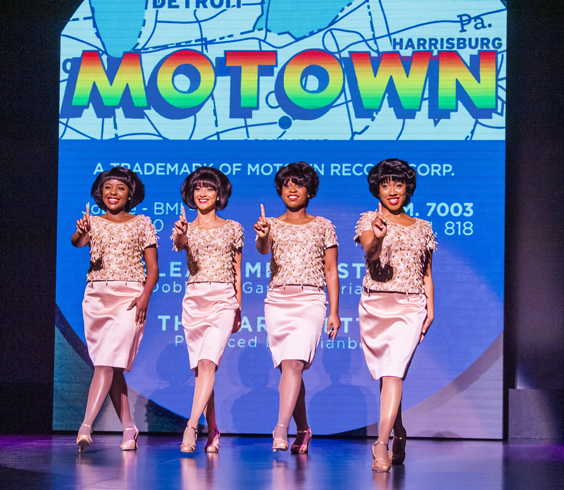 This touring production offers an exuberant and colourful celebration of the ‘Motown Sound’, a music so familiar to those of a certain age, and a music which so successfully merged black soul with rock and roll and pop during the second half of the last century. At times though it seemed the show risks being mis-named and one might speculate that an original working title could have been “Berry Gordy: The Musical”; he is credited as the original producer after all. Early on in the narrative we are told of the young Gordy’s ambition to be ‘great’ after taking inspiration from Joe Louis winning the boxing World Championship in 1938. But that ambition switches and music takes over. In the end we are spared from a wholly self-congratulatory life-story and the music speaks. An amazing sixty three songs, some featuring more than once and a handful offering accomplished solo renditions, are crafted almost seamlessly into the two halves of this boisterous, energetic show. Inevitably, but very appropriately, we are reminded of the part of Motown music’s intentioned role in helping to address the racial divide prevalent in the United States during the 1960s. Gordy is presented to us as wanting black-owned and black-performed music to make a breakthrough into popular music culture, but for it to be inclusive. Referenced is the courage shown by his artists when appearing before segregated audiences in the Deep South and the contribution, be it small or large, the enjoyment of the music made to the breaking down of social barriers. Sounds heavy? No, no way! This show is indeed, at baseline, a celebration of the music that takes so many of us down ‘memory lane’, offering fertile ground for personal reminiscence. Also an opportunity for those younger to understand the music that provided the background to their parents’ and grandparents’ lives. But, and most importantly, a confident cast enthuse the audience frequently into singing along, clapping hands and tapping feet. The finale, a reprise of ‘Ain’t No Mountain High Enough’ seemed to have the whole audience on its feet! The production reflects the amazing things that can now be achieved in modern theatre: the costumes, the lighting, the graphics and changing backdrop images, the latter helping to move the narrative along, obviating the need for explanatory dialogue, as in the assassinations of Martin Luther King and the Kennedys. As to be expected with a touring production there is the inevitable reference to the host city, in this case Bradford, and the equally inevitable cheer from the audience. It is a perhaps a shame that the local connection of Bradford’s very own Kiki Dee isn’t fitted in for mention, at this theatre anyway. She is the first white artist to have been signed to Motown, and a reflection of Berry Gordy’s desire that the music, largely populated by black artists, should be inclusive of, and meant for all, but that would perhaps have been a bit clunky to fit in. This is a truly ensemble show and I would not wish to single out any individual performer for special mention. Sometimes though, and unless the piece is very specifically intended as a solo, a featured singer can get drowned by the other voices. At the close of the first half, I felt that the morphing of ‘War’ into ‘What’s Going On’, overwhelmed the poignancy of Shak Gabbidon-Williams’ (as Marvin Gaye), vocal and emotion, particularly in ‘What’s Going On’. This is a fine and very enjoyable modern musical and, as my companion remarked, prior to the performance, “It has to be good, if it plays at Bradford’s Alhambra”. 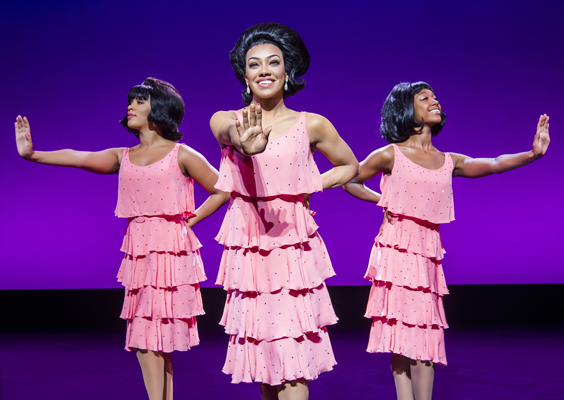 Yes it does and Motown: The Musical matches that standard with loads to spare.